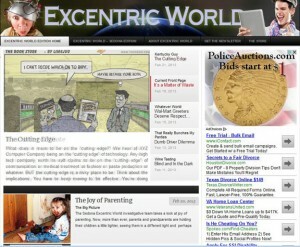 ExcentricWorld.com was launched in November, 2012 as the natural result of the success of its predecessor, The Sedona Excentric, to bring its goofy, tongue in cheek look at the world to a much larger audience. The Sedona Excentric was started in 1989, in Sedona, Arizona as a physical newspaper and today distributes over 10,000 papers monthly throughout Sedona, the Verde Valley, the Village of Oak Creek, Camp Verde, Prescott, Prescott Valley, Dewey, Oak Creek Canyon and Scottsdale resorts. The Excentric is proud to have the bragging rights as the only paper with full distribution. Since the paper is passed to our readers’ friends and relatives, we estimate as many as 30,000 people read the Excentric each month. Of course, some may just look at the pictures. As if that weren’t enough, The Sedona Excentric can now be accessed through ExcentricWorld.com as the Sedona edition, along with affiliated sites SedonaUSA.com, a site with Sedona tourist information and SedonaCam.com, a LIVE webcam site of Sedona, Arizona, making us possibly the most complete marketing firm in Sedona and possibly throughout the free world, potentially reaching millions of viewers and readers. It is our marketing strategy to offer advertisers an opportunity to showcase their businesses in a publication and website that presents articles in a humorous and entertaining manner. The public is bombarded daily with negative and depressing information. Therefore, we give our readers a chance to laugh at life and feel good about themselves and the situations around them. To place any form of advertisement in our newspaper or online, please contact Thom Stanley at (928) 639-4224 or email us at info@excentricworld.com.